Prime Minister Haider al-Abadi of Iraq announced the recapture of Al Nuri Grand Mosque in Mosul on Thursday from Islamic State militants, calling it a sign of the end of the extremists’ grip on the region and vowing to chase them out of the country. Mosul has still not been entirely wrested from Islamic State control despite a complex eight-month battle for the city. But Thursday’s announcement signified a further push to eliminate the group. As Iraqi forces claim control of the mosque for the first time since 2014, all that is left is debris. 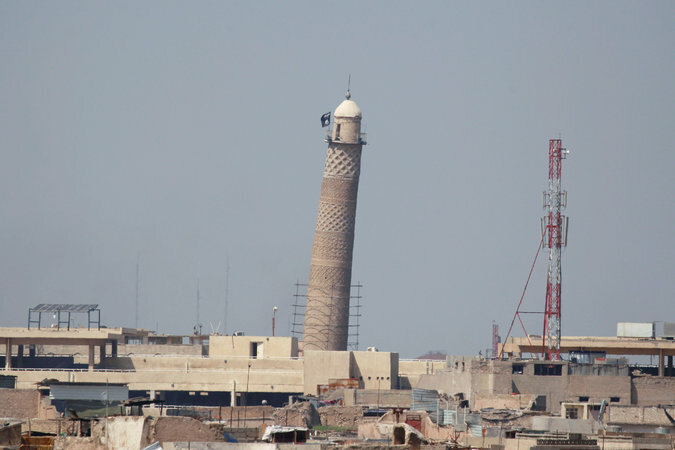 The mosque’s distinctive leaning minaret dominated the skyline of Mosul’s Old City for nearly eight centuries, standing as a symbol of the city’s deeply rooted cultural heritage. The mosque complex is nearly gone, reduced to a pile of rubble on June 21, after Islamic State militants packed the building with explosives as their grasp on the city continued to slip. The iconic 12th century Al Hadba minaret is now just a stump, seen broken nearly to its base in footage released by Iraqi forces who entered the area where the mosque once stood. They assessed what remained as they stepped carefully through crumbling walls and climbed over debris that once made up one of the city’s grandest buildings. “This is the remains of the minaret, which was blown up by the terrorist gang,” said one official from Iraq’s counterterrorism service in a video released by the group. The intricate detailing on the minaret can be seen peeking out over crumbling debris, but its top is gone. “And this is the dome of the mosque, which was also blown up by the terrorist gang,” the man says as the camera cuts to a shot of the green dome that now sits precariously atop damaged walls. It is one of the few distinctive features of the building still visible amid the ruin. After the city was captured by the Islamic State in 2014, the mosque played a starring role in the group’s propaganda as it grabbed power in the region. It was the setting for a rare 2014 public speech by the group’s professed leader, Abu Bakr al-Baghdadi, in which he declared a caliphate and asserted control over Mosul. It was the last time he was seen publicly. The group’s notorious black flag has been flying from the top of the Al Hadba minaret since that summer. Before the Islamic State seized control, the mosque was long a valued landmark the country sought to preserve. In 2012, Unesco identified the mosque’s minaret for assessment and preservation, after fears that its teetering posture could lead to collapse if measures were not taken. The local governorate had planned to work alongside local officials to ensure its survival. Last week, the director general of Unesco, Irina Bokova, lamented the loss of the building. The Islamic State, also known as ISIS or ISIL, has been under an intensifying assault in Mosul and across Iraq’s western border with Syria, where the extremist group is losing its grip on Raqqa, its de facto capital for the past three years. 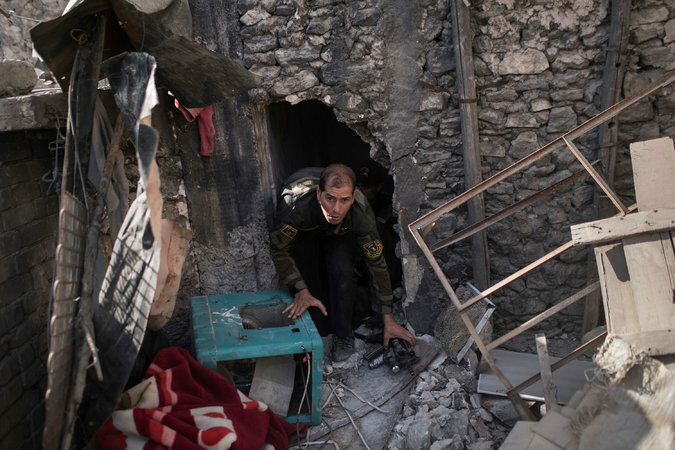 Tens of thousands of civilians remain trapped in both cities. Unicef said on Thursday that thousands of children in western Mosul are stuck there because of the fighting. “Boys and girls who have managed to escape show signs of moderate malnutrition and carry psychosocial scars of the conflict,” Peter Hawkins, the Unicef representative in Iraq, said in a statement. Aid groups that have been helping displaced civilians in Syria and Iraq expressed strong caution about the Iraqi prime minister’s victorious proclamation. They emphasized that the fighting in Mosul was by no means over. The International Rescue Committee, which responds to the most urgent humanitarian emergencies in more than 40 countries, said in a statement that as many as 1.5 million Iraqis have been unable to escape Mosul, and that at least 150,000 people, half of them children, still live in other areas of Iraq controlled by the Islamic State.